" Archana, have you seen naina??" grandma asked. "I dint she must be out with the maid or ajay " replied naina's mother, archana who is a PR in a reputed MNC firm and ajay naina's father who is a Senior Buissness analyst in a firm. Grandma was tensed since last night, after the big fight between naina's parents which made naina cry and shiver in dark in her room. After much asking naina had revealed that she did not want to live with her parents for she was thinking the fight was because of her. Grandma knew of naina's changing behaviour she was often reluctant of doing anything new, dint enjoy things outside, got quickly irritated and often felt low about herself but grandma felt helpless. She knew daily fights have chocked her darling granddaughter's life and all she could do was explain them but it never works. The story could be same in your home too.How many times have you noticed your child silently witnessing your fight from behind a door or a curtain? Have you ever wondered how harmful it can be for the psychological development of your child? You might be fighting in front of your kids but do you realize that your fight has serious effects on the emotional development of your child. Your fight puts him in an emotional turmoil as the child finds himself helpless and alienated. All of us before our marriages know that marriage is not a bed of roses its not easy to live into a relationship, there may be ups and downs as well but its so hard to accept it on a later stage. Fighting and making up may be a part of couples lives but couples are so busy making their points, raising voices and using abusing words that they completely overlook the effect it plays on their own child. Children are very observant and sensitive. They are quick to pick up on tensions and undercurrents. However, they donot understand what seriousness and reasons for your fights are. When they hear raised voices and slammed doors they can't help but wonder, "Is it me?". They end up blaming themselves to the extend that they feel like leaving the place completely.
" 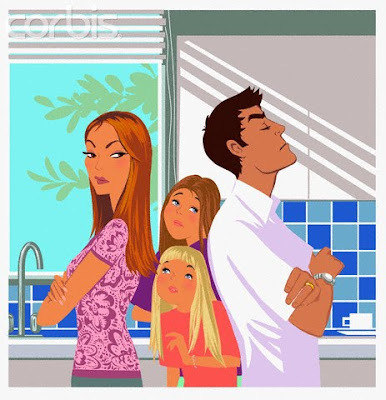 When parents fight, children feel the tension and the hostility. They become physically and emotionally upset. You can see it in their faces and their body language, even if they don’t say it with words. They may cringe, cower, or hide. Some children hold their breath, start to hyperventilate, or get nauseous. Others will cry. All of them-regardless of how they do or do not show it or say it-are scared stiff. " says Arti Khanna who recently met a child psychologist after reading her child's scared stiff symptoms. Children love their parents for what they do for them, they know parents are their security covers who would protect them against any odds. Once they see a completely wrecked picture of depressed life's of their own parents , their belief gets shaken in love, faith and marriage. They feel responsible for the big fight and always stay scared , to avoid being the cause of some other fight in future.In due process the child feels anxious, depressed, gets aggression fits and feels trouble interacting with his peers etc. Many children adopt completely wrong ways of alcohols and drug abuse to ignore and run away from this situation. They think it is either very normal to yell and fight and use abusive words, infact start bulling people around themselves or they turn completely timid. They carry lasting images of their parents fighting from their childhoods, long into adulthood. Memories of particular fights can traumatize children and stay with them forever. In general agreement psychologists say " Most parents disagree with their spouses on one or the other issues on various occasions. No one agrees on everything. Disagreeing with each other is natural and normal. But how you, as parents, handle conflicts with one another has a lasting impact on your children, their emotional health. " They suggest that " Adults need to learn how to resolve conflicts in a calm, peaceful manner through effective communication techniques. If your point can be correct so could be your partner's. Listen to each other. " In case even after trying a lot you had a massive fight in front of your children make it a point to let them know that they are no way to be blamed for this fight explain them that parents do fight at times but that doesnt mean they love each other or their children any less. Tell them how compassionate you are for them and whatever you said in fight was because you were angry and dint actually mean them.Even in families where parents fighting is not an extreme problem, parents should remember that what they do and say, and how they act towards one another, influences their child, their child’s self-esteem, and their child’s short- and long-term emotional health, as well as their future relationships. So the next time you enter into a fight spare a thought for the little one around eyeing on you, give him a life of genuine love and affection not forever trauma and stress.